Tahira Ahmad enjoys capturing life’s beauty and recreating it through her eyes. In her first collection of poetry, Ahmad explores a variety of topics that include unconditional love, faith, and happy connections. 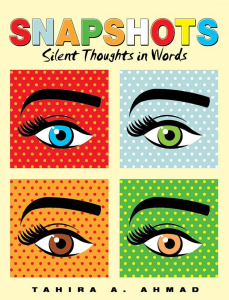 Snapshots: Silent Thoughts in Words shares a moving and inspirational collection of poems that reflects on one woman’s journey through life as she learns, loves, and finds the beauty in the world around her.